Suffering from reddish bumps all over your face? Is oily skin a problem for you? Let me show you how to remove acne and acne scars the natural way. Read my complete guide on using rosehip oil for acne and acne scars. Acne is one of the greatest beauty problems for men and women. It wreaks havoc on your face – ruining a wonderful complexion and turning your skin into a mess of redness and ugly bumps. Topical over-the-counter medications are full of harsh chemicals that can lead to skin irritation. Thankfully rosehip oil is a more natural yet effective approach to help combat acne and scars. Skip to the bottom to see our recommended products! 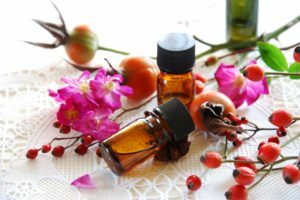 Rosehip Oil for Acne Scars – What is Rosehip Oil? Rosehip oil is extracted from the fruit (otherwise known as hip) of a rose plant. The hip is a cherry-like ball left behind after the rose flower blooms. On the other hand, rosehip oil should not be confused with rose oil which is derived from rose petals. So remember that rosehip oil and rose oils are completely different. Roses are full of vitamin C – a skin-healing vitamin! Rosehip oil also contains high levels of fatty acids, especially linoleic and linolenic. Also known as Omega 6 and Omega 3, these acids are important for producing healthy skin and repairing membranes. Just one of a few good reasons to use rosehip oil for acne scars. Research shows that skin surfaces of people suffering from acne have low levels of linoleic acid. Experts believe that applying this acid topically can help reduce the size of micro-comedones (tiny clogged pores). In addition, it also lightens discoloration caused by exposure to sunlight. 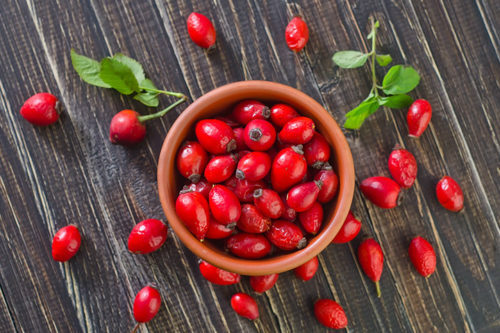 Rose hip oil is also antimicrobial, according to a Canadian study. They are effective in fighting bacteria that causes acne. The oil from rose hip also contains retinol. This vitamin A acid is known for its ability to promote collagen, delay skin aging, and help cells regenerate. Aside from retinol, rosehip seed oil also has trans retinoic acid known for maintaining smooth skin. According to an acne specialist, rosehip may be more effective than evening primrose oil in fighting acne. I like to apply rosehip oil directly in my skin, nails and hair. I wash my face using a natural cleanser, blot excess water, put a few drops of oil on my hands and pat it on my face. Then, I massage the oil slightly until it is absorbed by my skin. Afterwards, I rub the remaining oil in my nails and hair. Aside from rosehip oil for acne scars, you can use it as moisturizer or night cream. You can use it in combination with other oils such as jojoba oil. I love using organic rosehip oil. 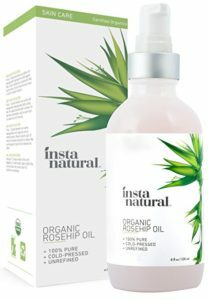 One of the products that I most highly recommend is InstaNatural Organic Rosehip Seed Oil Moisturizer. It is fast-absorbing and made with 100% unrefined virgin rosehip oil. In addition to using rosehip oil acne treatments, make sure to have a healthy lifestyle and drink lots of water. According to many acne experts, this skin condition is an indication that your body is dehydrated and needs proper nourishment. Acne eruptions are usually caused by an imbalance in your body’s pH levels. When your skin is dry and your body dehydrated, your body produces oil to compensate for the loss of fluid. Moreover, this excess oil attracts dirt and infection that leads to acne breakouts. Rosehip oil is full of nourishment and helps keep the facial cells free from blockages. It is antimicrobial, antioxidant and non-greasy to help control excess oil production and fight bacterial growth. Purchase the right rosehip oil for acne and see the difference in your skin. See recommendations below. I usually order my organic rose hip oils and other natural products on Amazon to find the best deal. Here are my top picks for natural rosehip oil acne treatments. I like this rosehip oil because it is certified organic and 100% cold pressed. Also, Radha Beauty makes sure that their product is cruelty-free and not tested on animals. 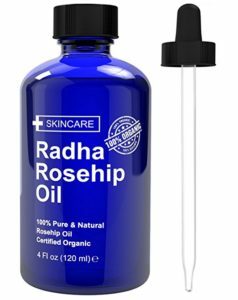 This rosehip oil product is an Amazon best-seller and most consider it their “holy grail” product for acne. It comes in a 4. Oz bottle and you only need 3 to 4 drops on your face, so the bottle lasts forever. Not only that, you can use it as an anti-aging treatment, moisturizer and even for removing crow’s feet. InstaNatural uses 100% cold pressed and unrefined rosehip oil to create this fast-absorbing, all-natural moisturizer. It is free from parabens, fragrances, and alcohol. Aside from rosehip acne treatment, you can use this product to reduce the appearance of eye bags, dark spots, and fine lines. You can get all benefits of rosehip oil in this product: supreme hydration, antioxidant protection, and lightening of scars and discoloration. Rosehip oil is effective in treating acne but it also makes your skin more vulnerable to sunburn. It’s better to use it at night. If you are using it during the day, make sure that you cover your face with sunblock. You should also test to see if you are sensitive or allergic to rosehip oil. Hence, apply a bit of oil in your elbow before you start using rosehip oil. Stop using is you see redness or irritation. Do you use rosehip oil acne treatments? Please share your experiences below. Don’t forget to bookmark our page for more updates on Nature’s Best Stuff.